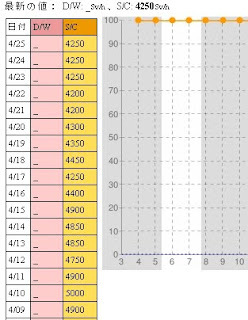 The operator of the troubled Fukushima Daiichi nuclear power plant is carefully monitoring the situation at the Number 4 spent fuel pool, where the water temperature is rising despite increased injections of cooling water. Tokyo Electric Power Company, or TEPCO, says it will inject 210 tons of water into the pool on Monday, after finding on Sunday evening that the temperature in the pool had risen to 81 degrees Celsius. On Friday, TEPCO found that the pool's temperature had reached 91 degrees, so it began injecting 2 to 3 times the amount of water. The Number 4 spent fuel pool stores 1,535 fuel rods, the most at the nuclear complex. Radiation levels were apparently about 300 sieverts per hour ... right after Chernobyl exploded. To be clear, the Chernobyl figure is radiation released into the environment, while the reactor 4 figure is radiation within the containment vessel. I have seen no evidence to date that reactor 4 is leaking. This is especially odd given that reactor 4 was supposedly shut down prior to the earthquake for maintenance. In other words, reactor 4 was - according to official reports - shut down, and shouldn't have very much radiation at all. Something doesn't add up. Indeed, the Japanese nuclear agency prominently displays the radiation data for all of the reactors except number 4 on it's main page. Number 4 is conspicuously absent, and you have to type in the url for the correct web page to find it. However, a Fukushima engineer says he helped cover up a cracked containment vessel at reactor number 4 for decades. On the other hand, the fact that no radiation is being reported in the drywell of reactor 4 (noted by "D/W" in the nuclear agency's tables) - while there it is for several of the other reactors - might imply that the containment vessel has maintained its stability. 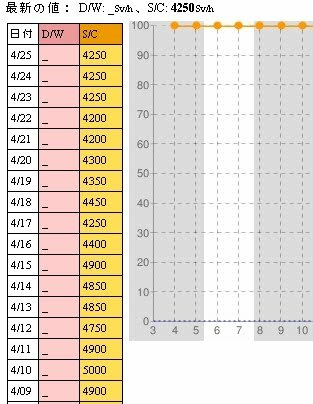 At this point, I don't have enough information to determine why the radiation levels inside reactor 4 are so high compared to the other reactors, let alone what it means. It might mean that reactor 4 is in trouble. On the other hand, it could mean that reactor number 4 is the only reactor which still has core integrity. In other words, maybe the other reactor cores have much lower radioactive levels because most of the radiation has already leaked out. Publish comments. People are finding comfort in an ignorance they do not deserve. And conscientious people deserve to know so they can react properly. Panicy people won't read them. Reactor 4 had no fuel rods inside it at the time of the tremblor. It is not the reactor vessel but the spent fuel pool above it, containing 1535 fuel rods, which is the source of the radiation. The pool is probably leaking and is empty apart from water being pumped onto it from above. This water is reaching the suppression chamber at the base of the reactor vessel, possibly via the cracked containment. Hence the high readings. Hmmmm...maybe #4 was being used as a boneyard for lots of spent rods from the other reactors and has many more than was officially disclosed. Didnt the GE operating manual specifically state that spent rod containment pools were only to be used as a temporary storage site? Maybe these guys got complacent & piled a crapload of spent stuff in #4. Has anyone done an audit of similar GE units' storage proceedures in the USA? Maybe #4 was used as a boneyard for spent stuff from the other units. Would they/could they co-mingle in it MOX rods from #3? Is the number of rods lots more than 1,500? Doesnt the GE manual say that spent fuel pools are for temporary use only? Did the suits get greedy & complacent & swept dirt under rug in #4? Has anyone audited spent storage practices for same GE units located in USA?